Musician and activist Neil Young celebrated his 71st birthday on Saturday with a visit to the Standing Rock Sioux Reservation in North Dakota. Young walked through the large Oceti Sakowin camp, playing a guitar and singing for the hundreds of people who have been demonstrating against the contentious Dakota Access pipeline for months. "Got my birthday wish today," Young wrote on his Facebook page. "Those who damage Mother Earth damage us all." Young, a Canadian who's lived in the U.S. since the 1970s, has been speaking out against the pipeline for several months, even releasing a song and video in September called Indian Givers about the Sioux Tribe's fight. Young previously advocated against the Keystone XL pipeline in 2014 with his song Who's Gonna Stand Up? Also in 2014, he launched the Honour the Treaties tour to fundraise for four First Nations fighting against expanding oilsands projects in Alberta. "The people of Standing Rock, and those who are supporting them, are standing up for their children and all of our children. We are letting the Dakota pipeline silence their voices. Not only are they desecrating sacred lands, but they also threaten to poison the Missouri River." All proceeds support the Standing Rock Sioux Tribe and supply resources and legal assistance to the "water protectors" fighting the pipeline. 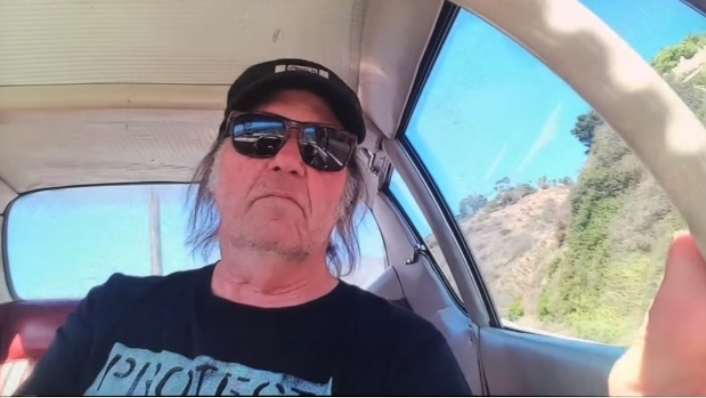 Responses to "Neil Young marks 71st birthday with visit to Standing Rock"
Looking Good, Neil! God Bless You!! :D xo.